Pollok can today confirm that Ewan McNeil has become manager Tony McInally’s 3rd signing of the summer. The 24 year old full back who left Stirling Albion earlier this month featured in all but one of Albion’s games last season. Ewan signs on a two year deal and will join up with his teammates as they return from their break next Saturday for the beginning of pre-season training. I’m really excited to sign for Pollok. It’s a big club and there’s some really good players here. 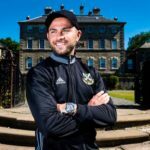 I had options to stay in the SPFL but once I had met with Pollok a few times I knew this was the right move for both football and personal reasons. It will be good to meet everyone next week at pre-season training and I’m looking forward to being part of the team. Hopefully we can make this coming season a successful one! After coming through the ranks at Rangers, McNeil also counts two seasons at Norwich City and spells with Brechin, Berwick and Clyde on his footballing CV.